Over recent years operators, councils and other stakeholders have invested heavily in attempts to modernise the UK public transport sector in what some commentators are labelling ‘the SMART revolution’. From Leeds to Bristol, pioneering initiatives like SMART ticketing and Real Time Information (RTI) are quickly becoming omnipresent and the benefits to both passengers and operators is obvious. For passengers, eliminating the need to queue at a bus stop or station to get a ticket is a clear advantage and for operators, any move that reduces cash management costs whilst at the same time boosting operational efficiency is welcome. However, in this new technological era it’s important to remember that not everyone is as quick, or as enthusiastic, to adapt and that needs, practicalities and demands vary so much across the different demographics. For example, some age groups, particularly those over 65, still use their bank accounts purely for budgeting purposes, meaning their only wish is to withdraw cash to pay for expenses. It’s also worth highlighting that even those with smartphones may not be utilising the technology to its full potential. So, as stakeholders grapple with the need to increase adoption rates how can we ensure that SMART initiatives remain an attractive- and fully inclusive- proposition? Searching desperately for loose change, or having to arrive at the train station early to buy a ticket, are common bugbears many commuters have faced but that’s all changing now thanks to the proliferation of SMART ticketing kiosks that enable users to pay for services in a variety of different ways. Public expectations have been set by a simple click on their phone leading to the arrival of goods a few hours or a day later, and ticketing innovators have risen to the challenge by introducing features like contactless pay that enable seamless purchasing which helps reduce queues and delays. However, to encourage usage, particularly for those slow to adopt, being kept informed is essential. In some circumstances, it may even be worth deploying physical staff at transport hubs to help passengers come to terms and feel comfortable with the new technology. Well-designed improvements in ticketing can help passengers feel that the transportation service is well linked and that they will not be unfairly treated for being unable to predict all journeys at the start of the week to get the cheapest fare. Being able to change a travel choice during the day or week, and being charged accordingly (and fairly), are attractive features to passengers and operators must keep up. Amidst the current climate of rising rail and bus fares, better ticketing can lead to a better perception in value, which could be because new technologies enable passengers to buy new types of tickets or because loyalty points can be collected with ease. The precedent set by Oyster also raises expectations that fares become cheaper when ticketing is overhauled and it’s true that SMART -integrated systems are helping to save operators significant amounts of money and these savings could be passed on. New technological innovations also mean it’s now becoming easier than ever before to receive automatic compensation during delays but perhaps the biggest impact on value perception is born from the fact that passengers don’t have to invest as much time in purchasing tickets. 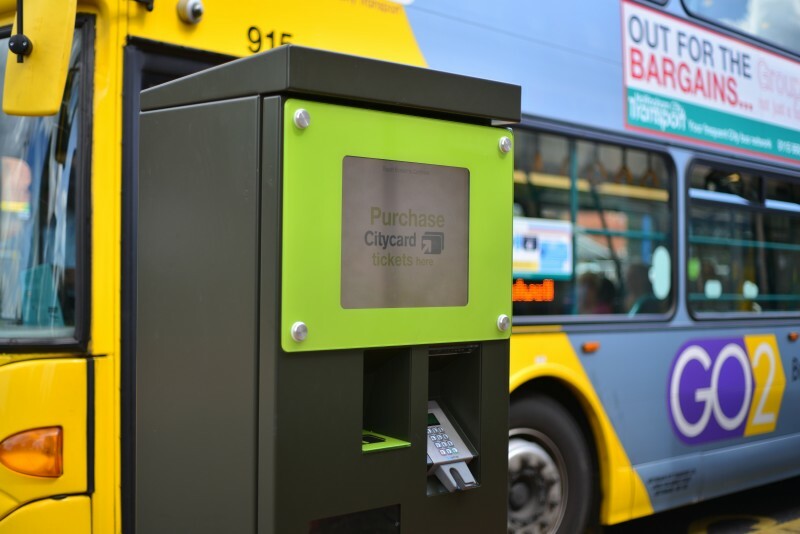 SMART ticketing schemes can quickly become second-nature to users, much like we’ve witnessed with Oyster and The Robin Hood initiative which has being rolled out across Nottingham. However, in order to achieve healthy adoption, design simplicity, in relation to both hardware and software, must be prioritised and that calls for greater collaboration between technology manufacturers, councils and operators. Many manufacturers, including us here at Cammax have teamed up with a number of public transport stakeholders to develop SMART ticketing kiosks that feature a completely configurable dynamic menu flow, making it easy for users to interpret information and follow instructions. These machines also integrate features like chip and pin, as well as contactless payment methods, in a bid to appease those who prefer to punch in their security details as well as those who want to pay with a quick swipe. SMART ticketing schemes can enable operators to build a relationship with their passengers, which benefits both commuters and the entire public transport network. It’s all too familiar now that many people feel like they have no relationship with the company that they spend several hundreds or thousands of pounds with but in this new technological era that has to change. A higher quality ticket can enable communication to be established and for trust to grow. Passengers can be informed about disruption and compensation can be issued far more easily to soften the pain of poor journeys. However, not all smart ticketing schemes automatically deliver on all or even any of these benefits. A poorly-designed scheme can feel less convenient and cause more frustration because it involves the effort of learning something new meaning it won’t be recognised as offering a significant improvement on what already exists. That’s why it’s vitally important to ensure schemes are designed and deployed with the end user at the heart of any strategy, not the technology. Passengers must also be able to influence the design of schemes, so that new initiatives combine positive elements from old systems alongside new features that counter-balance common frustrations. Further, more emphasis must be placed on how new schemes are communicated and the role staff play within it to reassure, inform and encourage adoption. For example, does the target market notice the new scheme and does it seem relevant? Do staff fully understand the scheme and can they be knowledgeable, positive and generate enthusiasm when discussing it with passengers? It’s important to remember that we are asking people to change from doing something they feel comfortable with to embracing something entirely new, which can be intimidating for some. We therefore need to reassure people that SMART schemes are the smart choice, but equally, support those who are unable or unwilling to change so they are not alienated from using public transport altogether.